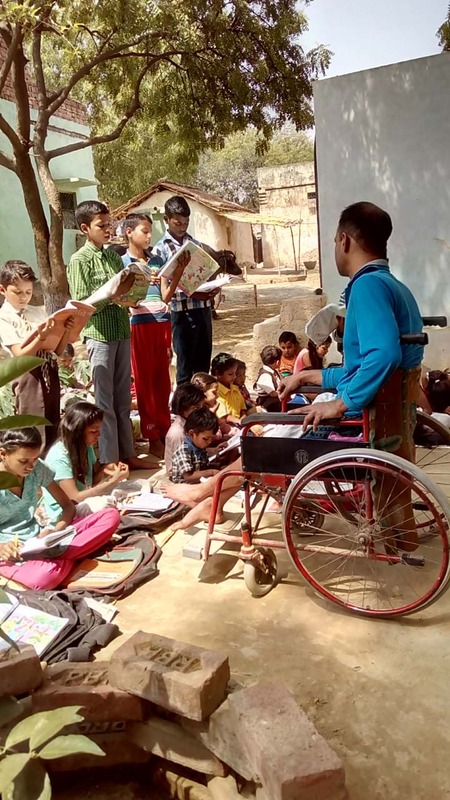 Help Physically Challenged Gopal Continue To Educate Village Children! 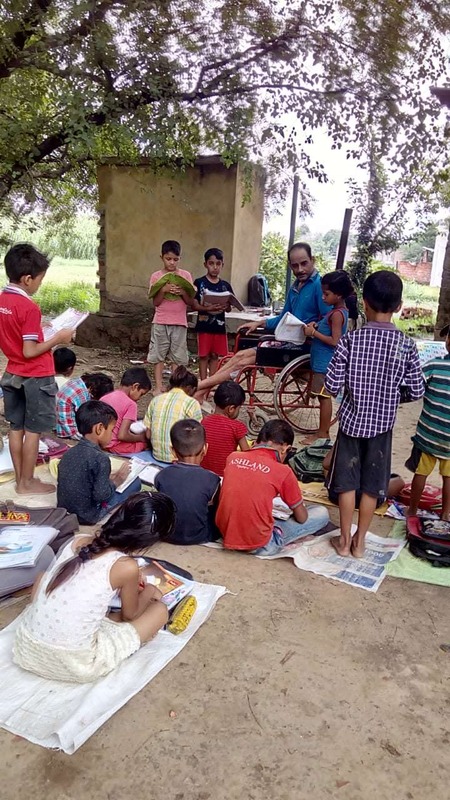 Gopal Khandelwal has taught hundreds of children for the last 19 years from the village ‘Patti Ka Pura’, near Mirzapur, Uttar Pradesh. Gopal spent his childhood on the Ghats of Varanasi. In 1996, Gopal had secured admission into SN Medical College in Agra. He was travelling through Allahabad on a bicycle when a car hit him from behind. He fell down and lost consciousness. When he woke up, he came to know that he was completely paralysed below the waist. He had lost the use of his legs, and also lost bladder and bowel control. Living in Varanasi became really difficult due to the small rooms and constant bickering by brothers and other relatives. A friend suggested he start his life afresh in a village where he had a little bit of land. The friend constructed a small room on the outskirts of the village ‘Patti Ka Pura’ near Mirzapur and then Gopal shifted there to spend the rest of his life alone in isolation. The friend had arranged for water and food to be provided every day from a villager. 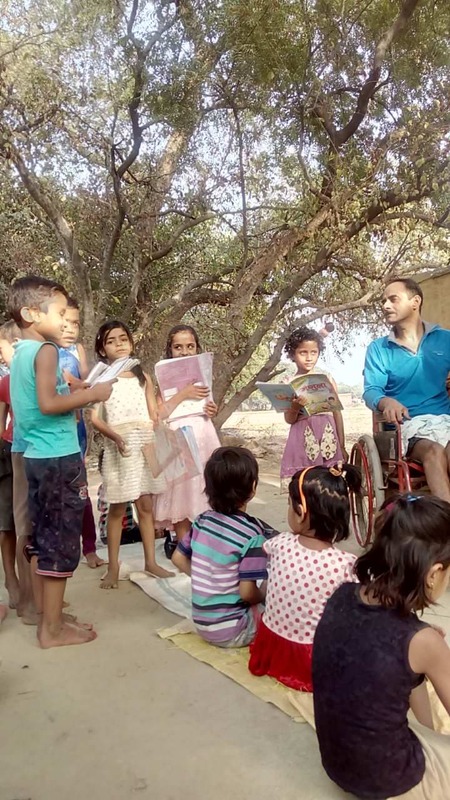 Gopal sensed that there was bitter casteism prevalent in the village and the children were not getting any education. The growing anger among the lower castes made him fear that they might be lured by the Naxals who affect the whole of Mirzapur area. He thought that he could change this if he gave the children good education and taught them to be better people so that the next generation doesn’t face the same problem. He started his free Gurukul teaching a 5-year-old girl in 1999. Many higher caste people were opposed to idea of teaching the lower caste children but Gopal carried on. Over the years, his Gurukul became well known in the village and the higher caste children too joined the Gurukul. Today, for the last 19 years he has taught hundreds of children. He also teaches the 5-year-old daughter of the first student who came to learn from him in 1999. The children from all castes sit together, learn together and play together putting behind all the discrimination and casteism. 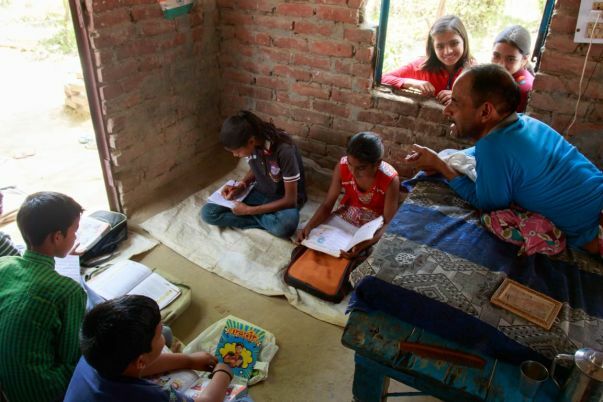 He now teaches over 70 children, ranging in age from 3 years to over 17 years. Gopal lives a room without doors, windows and just a tin on the roof. During rain, his little room gets filled with water. During a storm, sometimes his roof flies off leaving him totally exposed to the elements. 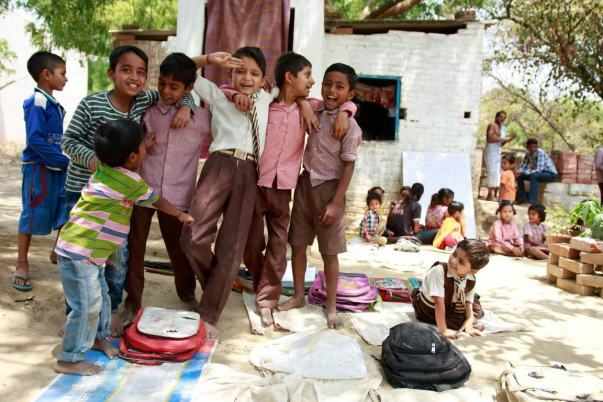 The children at the Gurukul too face the same problem when they sit under the open sky braving the extreme weather. However, the Gurukul is a place of joy and the children love to spend time with their Master Saheb. 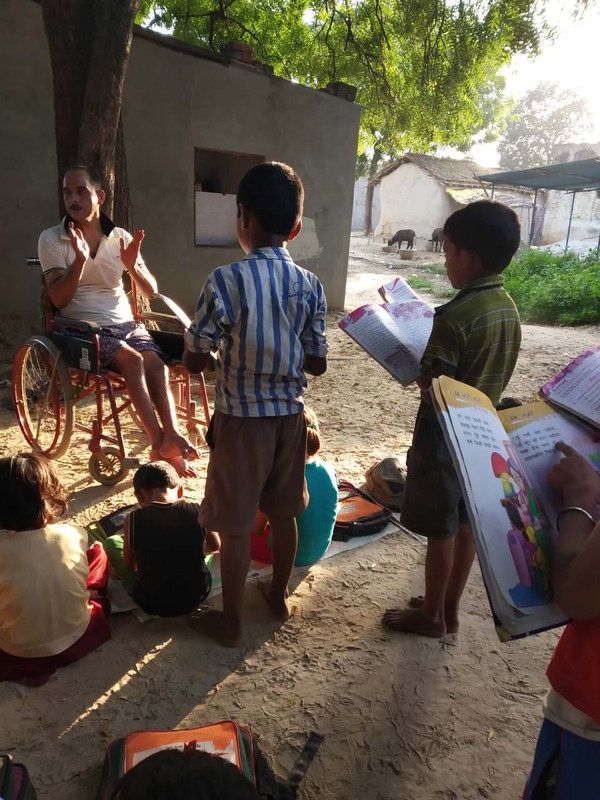 Gopal needs funds to buy stationary and books for the children, build a roof over the Gurukul area so that the children are comfortable to study. Gopal also needs funds for his medical care- he dresses his bedsores every day for the last 22 years. It takes 3 hours for him to dress his wounds and get ready due to his disability. He also hopes that one day he can do his spinal cord surgery in Lucknow and maybe walk again. Support Master Saheb in his endeavour! With your support, I have been able to make a seating arrangement for the children. We have also built a ladies toilet. I also have to undergo an operation and will be going to the doctor for a check up soon. Thank you all for supping this cause. I salute you all with folded hands. I am obliged to all of you for helping me. I am getting myself treated. These children need to be sent to school and a lot of things need to be done such as paying their fees, buying books and many more things. It is my humble request to you all to please keep sharing this campaign so that the children of our villages can grow up to be educated individuals and serve our society. I am attaching some pictures as well. I am delighted with the love and support given to my campaign. I would like to inform you that the construction of washrooms and classrooms have been completed and the flooring has also been done. Attachment of the doors and windows will be done by the end of the week as well. Further, I am planning to construct the roof and hand pumps for drinking water. Also, my health and medication is going well and my surgery will be performed by the end of the month. A heartfelt thank you to all of you for the constant love and support. Please keep supporting and sharing the campaign.